Palau Siren - liveaboard diving in Palau - Book now ! 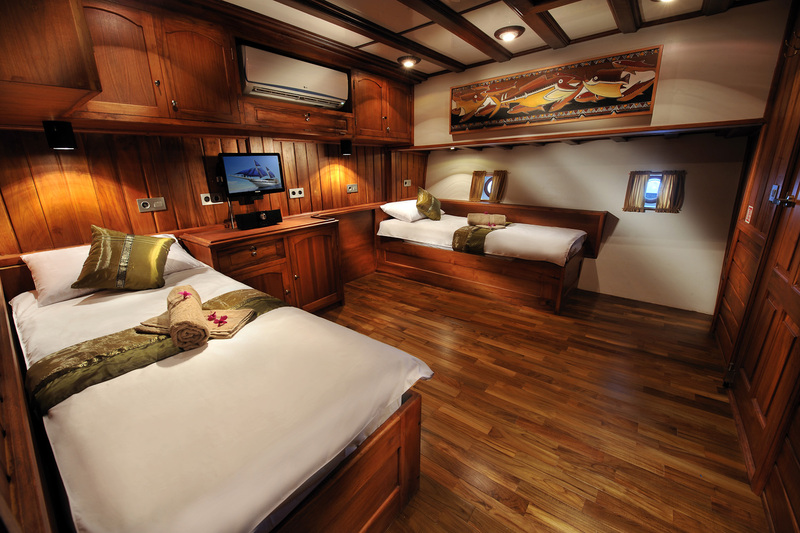 The 40 metre S/Y Palau Siren luxury liveaboard launched in July 2012 to offer year-round diving trips in Palau. 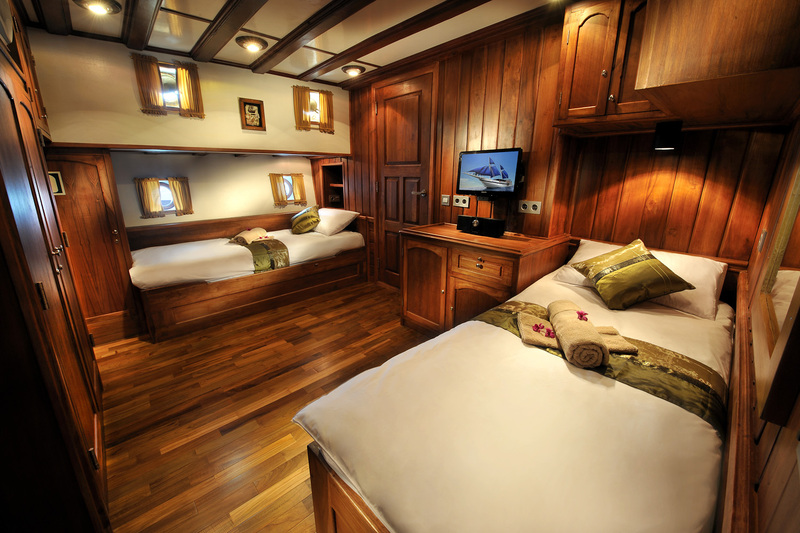 Built with the same specifications as her sister yachts, the S/Y Philippine Siren and the S/Y Indo Siren, the cabins are either fixed double or twin bed, however we offer flexibility with 2 cabins which can be converted from twin to double to suit the needs of our guests. The dining area is very spacious offering a great setting for all your meals. The dive deck is perhaps the most spacious and comfortable you would have experienced. Designated areas for charging and preparation of your camera and video equipment, the S/Y Palau Siren, as all Siren Fleet liveaboard yachts, truly sets out to be the pros choice for underwater photography and videography. Built on the Indonesian Island of Sulawesi, she is a traditional "gaft rigged Phinisi" handcrafted from ironwood and teak. You will find no other dive liveaboard as beautiful in the waters of Micronesia, and being that she was built by divers for divers you can rest assured every need has been thought of for the modern diver. Palau Siren caters for up to 16 guests ensuring abundant space for all divers. The crew of 12 is on hand throughout the trip to ensure you are well looked after. There are 8 large air-conditioned cabins each with their own personal audio-visual entertainment system and ensuite bathrooms with hot water through central heating system. Overbed reading lights and individual controls for your air-conditioning unit are provided for your convenience, as well as several cupboards for clothing and personal items, an in-cupboard safety box and a hairdryer. Each guest is provided with1 bath & 1 hand towel and a cotton bathrobe for use in the cabin Aboard the Palau Siren there are 2 dive skiffs and can split groups depending on experience level and site preference. Dives are led by the 3 western instructors and groups are typically no more than 6:1, though you may prefer to dive just with your buddy - the choice is yours! Many of the channels have strong currents and reef hooks are an essential piece of diving equipment, however diving in Palau is suitable for all levels of experience. Prices are per person per week and in USD based on 2 persons sharing a cabin. Exact pricing is available on the schedule here as prices vary dependant on the time year and the length of the trip and sometimes special offers are available. Essential dive equipment of Aqua Lung Wave BCD, Calypso regulator, 3mm shorty wetsuit, mask & fins. 12l aluminium tank & weights. SMB (safety sausage). Free Nitrox fills for all certified Nitrox divers! All meals, refreshments & snacks such as coffee, tea, herbal tea, fresh water, carbonated soft drinks, fruit juice, fresh fruit & cookies. Marine Park, Port fees and taxes are payable on board the S/Y Palau Siren and are priced in USD. Payment is accepted in Euro, US$, GBP or AU$, NZ$ as well as all major credit cards (excepting Amex). All credit card transactions will be billed in US$ dependent on the exchange rate at the time of your trip and an admin fee of 3.5% will be applied. 60 % is due to 90 days prior to departure - non refundable. 8 large air-conditioned cabins each with their own personal audio-visual entertainment system and ensuite bathrooms with hot water through central heating system. Overbed reading lights and individual controls for your air-conditioning unit are provided for your convenience, as well as several cupboards for clothing and personal items, an in-cupboard safety box and a hairdryer. Each guest is provided with1 bath & 1 hand towel and a cotton bathrobe for use in the cabin. Departing from Koror, the S/Y Palau Siren will spend 6 to 10 days diving a selection of sites including German Channel, New Drop Off, Ulong Channel and Blue Corner. The order in which the dives are done is based upon the currents, weather conditions and moon phase as we wish to bring you to the best sites at the optimum time to dive them. In Malakal Harbour we dive the Iro Maruwreck and Chandelier Cave. Whilst at Ulong divers can expect a speedy drift along the reefs with schools of snappers and trevally at dive sites such as Ulong Channel and Siaes Corner. Divers can enjoy the spectacle of spawning bumphead parrotfish and grey reef sharks are known to breed here with many juveniles often be spotted amongst the groups. Schools of grey reef and white tip sharks congregate a Blue Holes / Blue Corner. German Channel is the place for manta ray action at the cleaning stations. Several mantas may be seen here as divers rest on the bottom to watch the display or swim in the shallows as the mantas approach. At Peleliu Island schools of snapper congregate to spawn near “the Cut” meanwhile lucky divers may meet bull sharks, silver tips and black tip reef sharks. During our 10-night liveaboard trips we also offer the opportunity to visit the furthermost island dive sites to the north at Badeldaob Island, however this will be based on conditions at the time of trip departure. Large rinse tanks with fresh water solely for camera and video equipment. Worldwide Dive and Sail considers the safety of our guests and crew the preeminent issue aboard our yachts. 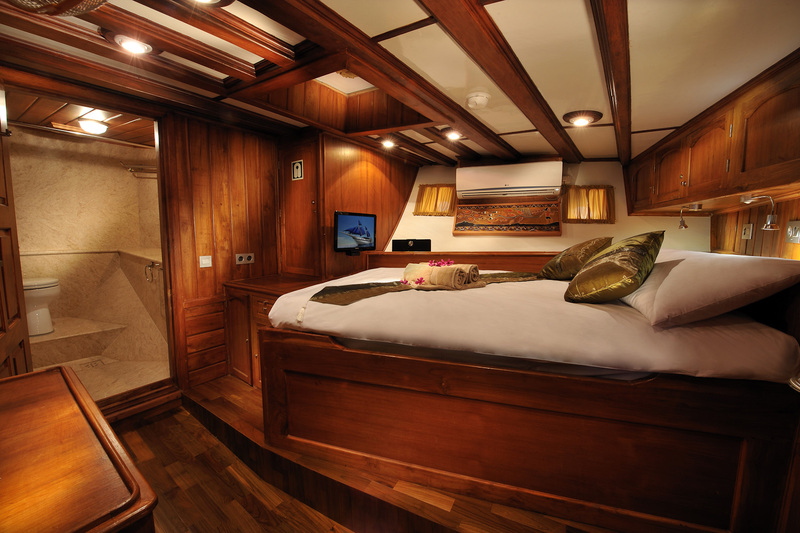 The S/Y Palau Siren liveaboard has been designed and constructed to the highest standards. She is equipped with the latest safety features including Automated Life Rafts, Life Jackets, Fire Extinguishers, Smoke Alarms, Emergency Long Distance Radio, Satellite Phones and EPIRB. Each crew member of the S/Y Palau Siren has received extensive training in all aspects of safety, emergency management and evacuation procedures. Our crew keep their skills fresh and up to date withregular practice drills. The dive team are all emergency medical responders and on board you will find a fully stocked medical box for treating minor ailments and injuries, along with a full supply of medical grade oxygen and DAN Oxygen provider kits. Upon boarding, guests will be requested to try out life jackets and briefed on emergency procedures by our cruise director. We also offer the optional use of the Nautilus Lifeline, which can be used by divers to contact the yacht in the unlikely event they surface separated from their group. “this is the only live aboard we have been on where we were actually shown where our lifejackets are AND had a proper “muster drill” where we had to each get our lifejackets and go to the area where we would go in an actual emergency with our lifejackets. Never felt anything but safe on this trip.” Ann Mecklem, Palau Siren 2012. All guests should ensure they have adequate dive and travel insurance from a reputable supplier such as DAN - Divers alert network. Palau liveaboard diving is consistently chosen as one of the world’s premiere diving destinations by several international diving publications, Palau features enchanting topside topography as well as breathtaking underwater landscapes. Experience big fish action at the Blue corner and New drop off. Shafts of light cutting through deep shadows create a near-religious experience at the Blue holes, German channel, Chandelier cave, Pelieu, Siaes tunnel, Ulong channel, Wrecks and many more Palau offers some of the most unique holiday possibilities: its natural beauty and untouched wilderness, intact culture, remoteness and stability combine to offer a fantastic destination for adventure seekers. The spectacular walls along the barrier reef, including such favorites as Blue Corner, Ulong Channel, Big drop-off and many other sensational offer dive sites yet to be charted. You can expect mostly wall and drift diving with visibility ranging from 20m / 70 feet to 50m / 150 feet depending on prevailing conditions. All our boats are liveaboards for people enthusiastic or serious about their diving but also welcome snorkellers and non-divers who will have their own separate itinerary. It is located between Guam, the Philippines and Papua New Guinea. Palau is a 400-mile long archipelago, which hosts one of the world’s most unique phenomena - “ Rock Island”. These mushroom like islets are uninhabited and located in a large lagoon that has a vast concentration of corals, fish and other marine life. White sand beaches, lush jungle and remote waterfalls are just among the highlights of Palau. The islands of Micronesia are scattered over three million square miles of the North Pacific. Palau is the Pacific’s newest nation, a Mecca for divers and home of the exquisite Jellyfish Lake. The Republic of Palau lies east of the Philippines and comprises of some 350 islands. They are grouped in six clusters stretching to 400miles from North to South, Kayangel Atoll to Tobi Islands. Palau is world renowned as an unsurpassed dive destination that also offers the sublime Rock Islands, dramatic waterfalls, pristine white sand beaches and some of the most intriguing native flora and fauna found anywhere in the Pacific Ocean. Explore the beauty of Palau with the Big Blue explorer. Palau has been described as one of the Seven Underwater Wonders of the World, with 700 species of coral and 1,200 species of identified fish. Palau provides some of the best diving to be found in Micronesia and ideally is suited for advanced divers. The spectacular walls along the barrier reef, including such favorites as Blue Corner, Ulong Channel, Big drop-off and many other sensational offer dive sites yet to be charted. You can expect mostly wall and drift diving with visibility ranging from 20m / 70 feet to 50m / 150 feet depending on prevailing conditions. Diving Palau by liveaboard brings you to the far flung dive sites along with some of the most renowned sites of this tiny island chain. The S/Y Palau Siren was constructed, like her sister ships, by the Worldwide Dive and Sail’s team of master yacht builders in Sulawesi, Indonesia. 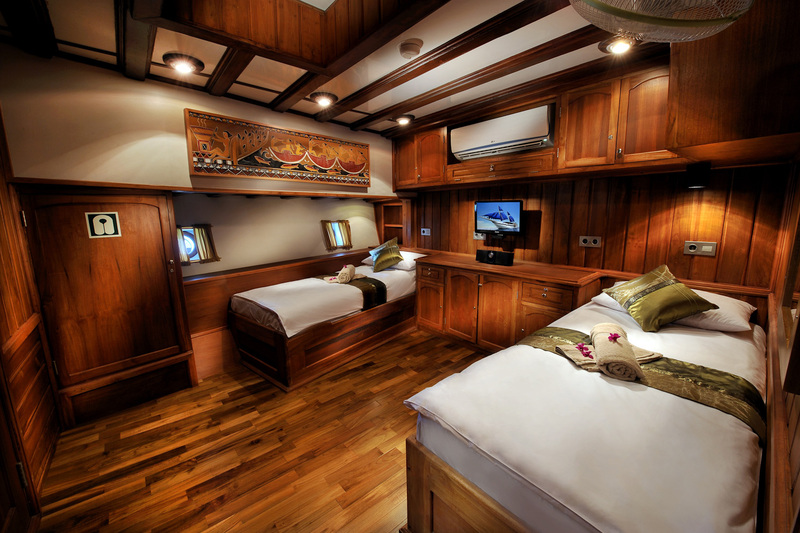 All the small touches and comfort of our Siren Fleet liveaboard yachts have been included, coupled with new design features and interior decoration to reflect the style of the Palauans. Enriched Air Nitrox is FREE for all certified Nirox divers. If you are not a certified Nitrox diver all our instructors can certainly teach you the Enriched Air Diver Specialty during your liveaboard trip. Diving in Palau affords the avid diver the opportunity to explore the nation’s varied and spectacular dive sites. Laying between the Philippine Sea and northern Pacific Ocean, these limestone islands surrounded by crystal clear cobalt blue water are home to a dazzling array of marine life. Divers travelling to Palau can expect to see a variety of reef sharks, huge schools of jacks and barracuda, manta and eagle rays, Napoleon wrasse and batfish coupled with many critters and impressive corals. Drift divesare the norm and there are plenty of wrecks to visit and of course no liveaboard dive safari would be complete without a visit to the now-famous “Jelly Fish Lake”. Palau Siren cruises between wrecks and caves in Malakal Harbour, Ulong Island, German Channel, Ngemelis Island and Peleliu Island before returning to Koror. Our itineraries provide a mix of wreck diving, drift diving and night dives. Reef sharks can be seen in abundance, along with manta rays, stunning coral reefs and huge sea fans. A variety of smaller creatures can also be seen during our liveaboard diving trips. We recommend that you arrive one night prior to the boat’s departure date, though we remain flexible if this is not possible. Continental Micronesia, a branch of Continental Airlines, holds flights to Palau via Guam (daily) or Manila (Wednesdays and Saturdays). Guam can be reached from Hawaii, Western USA, Australia, Seoul and Tokyo. Manila is a major hub serviced by flights from Singapore, Bangkok, Hong Kong and Kuala Lumpur, amongst others. However, check up-to-date fares and schedules on //www.continental.com/. Also be sure to check the up-to-date baggage restrictions and requirements for your flight. Occasional direct flights to Palau are available from Taipei. We recommend that you make reservations ahead of time as well as purchase travel insurance in case of last-minutecancellations. We can assist with a special rate for a return flight from Manila to Palau (Manila - Palau - Manila) of $575; the regular rate is $760. U.S. citizens must show proof of U.S. citizenship (birth certificate or passport). Non-U.S. citizens must show passport. There is a free 30-day visa issued upon arrival. At the Palau airport, you will be picked up by your hotel or the boat representative and transported to the boat dependant on when you arrive. Bring very casual and lightweight clothing. Quick-dry material or light cotton works well, with maybe one long-sleeved shirt or sweater for chilly nights. We also recommend a waterproof jacket or windbreaker. On the island, dress is very casual, though beachwear in town is inappropriate. We recommend bringing hats,sunscreen and sunglasses. Palauan and Englishare both official languages. Both are widely spoken. The U.S. dollar is used throughout Palau. Credit cards are widely accepted. Traveler’s Checks in U.S. dollars can also be widely used as cash or exchanged. There are quite a few 24-hour ATMs in banks on the main road in Koror. Bank of Hawaii and Bank of Guam are represented. 24-hour electricity comes in 110 and 220/240 volts, with standard U.S. outlets for two/three prong plugs. There is no malaria. We recommend drinking bottled water. The hospital on Palau is the Belau National Hospital, located in Koror. There are also two private clinics. There is a hyperbaric chamber at the Belau National Hospital. Palau, Japan and Korea are 9 hours ahead of GMT (Greenwich Mean Time, in London), Palau = GMT + 9. Central Europe (Geneva, Berlin, Paris) = GMT +1. Eastern Europe = GMT + 2. Moscow = GMT + 3. China, Singapore = GMT + 8. Sydney, Guam = GMT + 10. US Pacific Time = GMT - 8. US Mountain Time = GMT - 7. US Central Standard Time = GMT - 6. US Eastern Time = GMT - 5. (Note: US times advance one hour on summer time, April to October). Year round our climate is pretty uniform, at an average of 82 degrees F (27 C). Average humidity: 82 %. Rainfall, at 150 inches/year, can occur throughout the year. Though sometimes it rains more during July through October, this “rainy season” doesn’t have a definitive start or end, and the weather is always changing and unpredictable. However, it is always dive-worthy, we have never had to cancel a dive trip! Upon leaving Palau, there is a departure tax of $20 and $30 Green fee. Accommodations in Palau range from budget motels to very upscale resorts. The US Dollar is the official currency of Palau. The majority of established hotels, shops and restaurants accept major credit cards or travelers cheques. Occasionally smaller, family-run business will only accept cash. There are several US operated banks and plenty of ATMs so cash is readily accessible, however the rate of exchange is very poor and guests would be advised to change money prior to arrival in Palau. Palau is 7 degrees north of the equator and enjoys a warm tropical climate year round. Temperatures average 27°C (82°F) and as a tropical island Palau is subject to rainfall throughout the year though more frequently between July and October. Diving is excellent year around though the peak season is considered to be November through May. The warm tropical waters of Palau are pleasant throughout the year averaging 27°C (82 °F). Most guests will find a 3mm shortie or even a skin suit is appropriate, though if you feel the cold easily you may wish to opt for a 3-5mm long suit. Health care is readily available in Palau. The Belau National Hospital is a professionally staffed hospital with an experienced barotraumas team. Follow normal precautions with food whilst travelling to prevent stomach upsets and be sure to drink bottled water only. On board Palau Siren you will find a fully stocked first aid kit, AED and medical grade O2. Basic supplies will be made available to you, if you require medication please ask your cruise director. For diving related emergencies there is a recompression chamber in Koror. Speedboat evacuation from the boat would be necessary thus diving specific insurance is a must on any liveaboard dive trip. Palauan and English are the official languages of the Republic of Palau, though you may hear Tagalog, Japanese and Mandarin too. The population is predominantly Christian and there is approximately 10% of the population adhering to traditional Palauan customs. We recommend our guests are respectful and wear suitable attire when making island tours or visiting religious buildings. What dive experience level is recommended for Palau Liveaboard trips? Whilst most dives are suitable for divers of all levels, beginners may find some dives challenging and prefer to skip the dive. Currents are to be expected at sites including Blue Corner and Ulong Channel. your cruise director and dive team will be on hand to advise so you may decided whether the dive is suitable for you. We recommened having advanced experience or taking your PADI course whilst onboard to maximise your enjoyment from the trip. Are a reef hook and/or surface marker buoy (SMB) necessary items of equipment and can you provide them on board? It is recommended that each buddy team dive with a SMB in order to signal to the dive tenders you are ready to surface. Some boat traffic is to be expected in busier areas however it is not necessary to drift with your SMB for the entire dive time. SMBs are provided free of charge. Reef hooks are a strongly recommended item and will maximise your enjoyment of dives such as Blue Corner and Siaes Corner. Reef hooks are currently not available for purchase on board so guests are advised to purchase ahead of their trip.